Hidden Arsenal 7: Knight of Stars includes cards from the OCG Duel Terminal - Sacred Star Knights!! 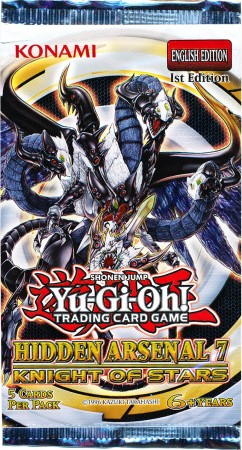 and the OCG Duel Terminal - Ouroboros, Wicked Dragon of Destruction!!. It is the seventh and final series of Hidden Arsenal, following Hidden Arsenal 6: Omega Xyz. The set was originally scheduled to be released on April 19, 2013, but was delayed a week, until April 26. This set introduces the new "Constellar" and "Lswarm" archetypes as well as further support for "Laval", "Gem-Knight", "Gishki" and "Gusto" cards. It also features cards used by Raff, Bronk Stone and Nelson Andrews. Each TCG pack contains 5 foil cards: 1 Secret Rare and 4 Super Rares and each box contained 24 packs. This page was last edited on 18 March 2019, at 02:45.